A quick and easy meal, perfect for Meatless Mondays! 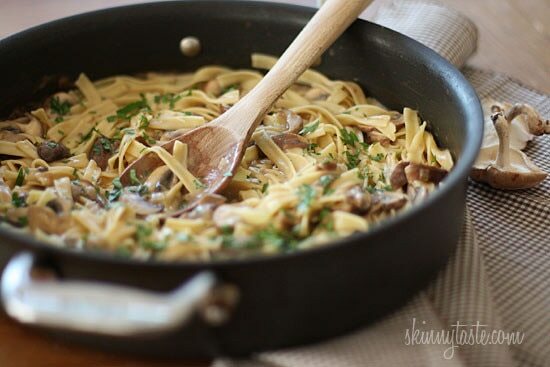 A stroganoff of Shiitake, Baby Portabella and Cremini mushrooms with noodles in a light creamy sauce. More or my favorite meatless Monday pasta recipes are Fettuccini with Winter Greens and Poached Egg, Cheesy Baked Pumpkin Pasta and Pasta with Asparagus. 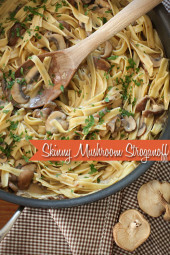 I played around with Mushroom Stroganoff a few times last week (until we were sick of it) for a Meatless Monday option. Now don’t get me wrong, I love Beef Stroganoff, so for me it was a challenge to get the flavor of the beef without using any meat as well as keeping it creamy yet light. The bonus of making it without the beef is that you can eat more for less calories and fat. Using a variety of mushrooms gave nice textures and flavor and the Worcestershire sauce and tomato paste helped give me some of that beef flavor I was looking for. As a kid, I always topped my Stroganoff with grated Parmesan cheese. This is completely optional, but I personally think it makes any noodle dish go from good to great. Hope you enjoy! Meanwhile, while the water starts to boil for the noodles, heat a large nonstick skillet over medium-high heat. Melt butter over medium heat and add onions to the pan. Cook 2 – 3 minutes over medium-low heat. Add flour; stir with a wooden spoon for 30 seconds. Gradually add broth, Worcestershire sauce, and tomato paste, stirring constantly. Add mushrooms, thyme, salt and pepper; stir and cook 4-5 minutes or until thickened and bubbly, stirring constantly. Add wine; bring to a boil, reduce heat, and simmer 4 minutes. Remove from heat; let stand 30 seconds. Stir in sour cream; add noodles, mix well and garnish with parsley if desired. This is a wonderful recipe. Aren’t cremeni mushrooms and baby Bellas the same thing? I’ve made this twice and it’s delicious, but it comes out thin …. more like a soup than a sauce. What can I do to help thicken it up more? Do you think you could substitute Greek yogurt for the sour cream? Would nonfat work or do you need some fat for the recipe to work? I tried this last night with 0% Fage Greek yogurt & beef broth, Came out great!!! Thank you! I made this tonight. I didn’t use as much sour cream because we are not fans but didn’t change anything else. Was a bit hit…we loved it!! Thanks for the recipe! This is a great recipe. Very satisfying, although my husband thought it would be great with some meat in it. : ) I will make this again. I make it with 50% lean ground beef and 50% lean turkey, as my husband won’t eat it without some meat in it. It’s delicious! I LOVED IT!! So did my hubby. We used beef stock but did everything else exactly. Thank you for your wonderful recipes!! We are trying to cut back on meat lately. These types of recipes hit the spot! Is there something non dairy I can use in place of the sour cream? Thanks! This is EXCELLENT!!! Made this last night – used whole wheat spaghetti instead of the noodles. Also changed the method a little — put a little sear on the mushrooms before adding the broth. Other than that, everything else the same. Very creamy and satisfying!!! Wow! Just Wow! I have to say this was one of the quickest, easiest meals to throw together on a weeknight and really didn’t miss the beef at all. I will definitely be using this recipe again. I love your meal planning help – has been a game changer for this busy mom. Hi Gina – love your recipes! I’d like to make this without the white wine or sherry – is that possible? Is there a substitute that I can use? Use more broth in it’s place. So good. Even my meat-and-potatoes husband liked it–it’s a hearty meatless dish (we did use beef broth). I used all crimini mushrooms, thickly sliced. It’s so easy and quick to make; great weeknight dinner, and it tastes like it took much more time and effort than it does. My 6 year old son keeps asking me to make beef stroganoff, but I want to make a healthy one and definitely don’t want to do the boxed version. 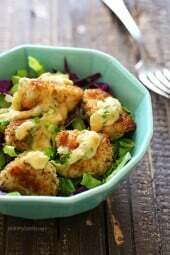 I was thinking of making this, but adding ground turkey or ground beef to brown with the onions. Would that be the right time to add in the meat? Thanks! Gina – Could you use marsala wine with this recipe!? I have some and don’t use it often so I was just curious! Yes, I’m sure it would taste great! 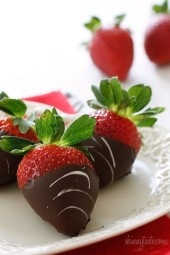 Making this tonight and sooooooo excited! We love your recipes! Thanks, Gina! I’m challenging myself to do a Julie/Julia version of Skinnytaste. 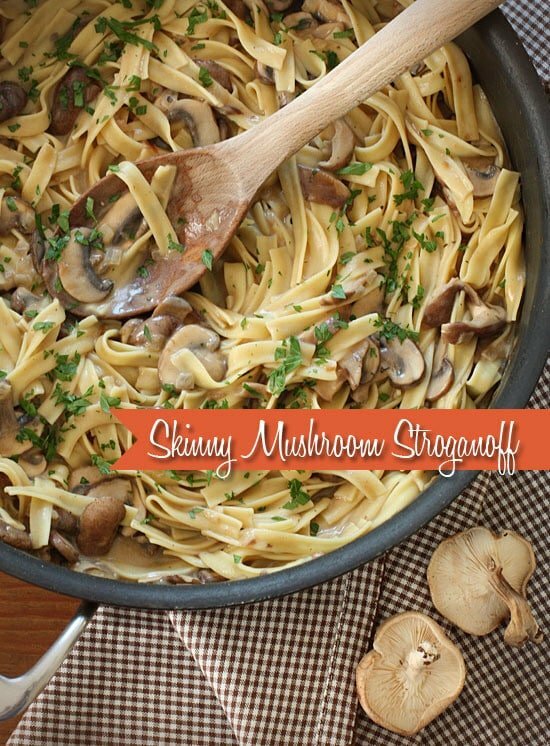 Starting today with your first meal plan on made the meatless Monday mushroom stroganoff. It was delicious and my husband LOVED it. I’ll keep you posted on my progress and I am looking to lots more great recipes to try! I am a big fan of this site, I have made quite a few things and loved them all. This recipe I couldn’t get the sauce to thicken not sure what I did wrong, but the flavor was so good that I know I will try again. The other thing I did was instead of using pasta noodles, I made this with zucchini noodles. This was a great work lunch for me through the week. Very filling. Thanks for a new addition to my zoodle menu! Not sure how many points this is without pasta? Is the smart points mentioned the new 2016 WW plan? This looks so, so good and I can’t wait to make it soon. One note. If you are including Worcestershire sauce, it isn’t vegetarian. Most worcestershire sauce contains anchovies–not a vegetable. There are vegetarian versions out there, but they can be hard to find. Some folks will substitute soy sauce (for the saltiness) or steak sauce for the peppery flavor. 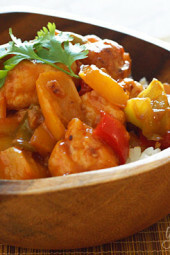 We love this recipe and have made it many times!! So simple and delicious – our kids love it too! I’m from Australia and we don’t have that type of pasta. What other types can you use? How many calories/kilojoules should the actual pasta have been per serve to be similar to the one you use? Any noodle you have available to you would work. This was fabulous! I love beef stroganoff, but it's such a splurge. It's nice to find a safer option. Next time, I might sauté the mushrooms before adding the broth. Used half white mushrooms and half crimini. Can't wait to have the leftovers for lunch. Cooking for one: can this sauce be frozen in individual portions so I can cook the noodles as needed? Oooh was this good tonight! I used White Wine vinegar, and then realized it wasn't cooking wine. So then I added 1T Cooking Sherry. I also used gluten free flour. My husband loved it, as well as my handicapped son. He had his mouth open before the spoon arrived with another bite! This is definitely a keeper! Thank you, Gina! I'm curious about the 1 tsp tomato paste. It seems funny to open a can of it just for that minute amt. For the Freezer people out there, here's what I did. I made the sauce up to the point of adding sour cream & noodles. I also *slightly* under cooked the mushrooms. I then spooned it out in serving size and froze flat. I did all that last week. This week I needed a quick dinner so put water on to boil noodles. I pulled a bag of mushroom sauce from the freezer tossed in a pan with a little fresh garlic and reheated it gently, then added the sour cream and some fresh parsley at the end. Came out great. Mushroom texture was just perfect. I highly recommend. Good luck! Just made this a couple days ago and we enjoyed it! I used sliced cremini mushrooms, egg noodles, and red wine since that's what we had. Tasted like beef stroganoff without the beef :-). Was also pretty quick to prep. Next time I may chop up the mushrooms a bit more since some of the slices were large. Delicious! I made this tonight for the first time and it was amazing!! I doubled it for my family of five and we had it with fettuccine. Even my super picky 7 year old ate it! This will definitely be a go to meatless meal! It was super fast to throw together too! Thanks again Gina!! This came out fantastic! The adults loved it, but my seven year old ate the mushroom gravy on a turkey/zucchini meatball sandwich. We're definitely making this again. I WILL be making this! 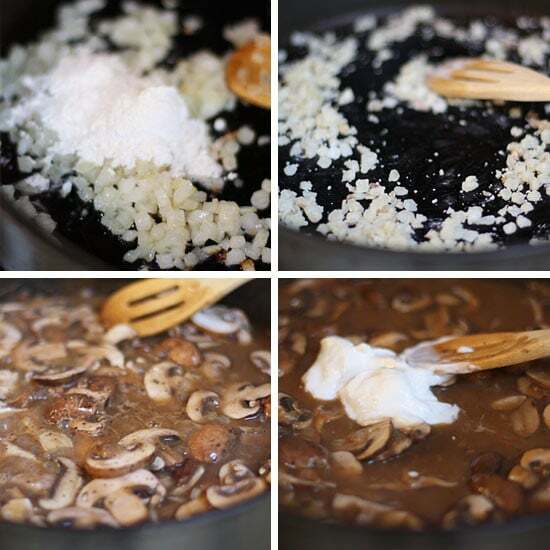 Looooooove mushrooms and stroganoff! Thank you! For starters, let me say I love your recipes. I've taken so many and worked them into the routine, and made some my own. This one I'm excited to try since we just worked in Meatless Mondays to the routine. I'm planning on switching out the sour cream for cream cheese, since the taste stands out too much for me. Anyone else do this and liked the final result? Absolutely delicious! I love that the recipe is easy to halve since I'm the only one in my house that eats mushrooms! I have made this twice now. It's just amazing! I had company come visit, and actually prepared the noodles ahead of time and the mushrooms. I cooked the noodles per package directions and then ran cold water over them to stop them from cooking further. I put them in a container and popped them in the fridge. I also used button mushrooms instead of the others, thick cut, and cooked them ahead, though I didn't cook them all the way, just enough to get them somewhat done, but not so they were over-cooked. So all I had to do was to make the "sauce" using the remaining ingredients, and then add the noodles, and mushrooms. Have no fear if you do this when you pull the noodles out of the container. They are all stuck together. I just put the whole "noodle block" into the sauce and as I stir everything around, the noodles fall into the mixture the way they should. Also, I didn't have white wine, but i did have a classic red, and used that. Another time I used a sweet rose, and either way, the stuff turned out great. I think you are okay to use whatever wine you have on hand unless it's a super sweet dessert wine like a moscato. Made this for dinner last night and can I just say WOW!!! Super easy and super delicious. I used beef stock instead of the veggie, and for a meatless dish you really can't tell. This is the second time I've tried one of your recipes this week and I am sold on Skinny Taste. Thanks for sharing your cooking genius with the rest of us that are trying to eat healthy & nutritious meals that actually taste wonderful. Looking forward to trying out more recipes. This was awesome!! The only thing I did different was sautéed the mushrooms with the onions. This will be one of my new go to meals. So easy and fantastic flavour!